New features include 41 fields (up from 16/29), and export filtering. I'll open an actual bug report with more details. Thanks. Give us the book IDs. Very happy to see this new feature!! I ran a tab-delimited export to find books to be read (a collection), that I already own (a tag). This produces a list of books that matches a similar library search in terms of number of books and their titles. However, in my library all of the books have an Entry Date. In the export only about 1/3 of the books have an Entry Date, and that date also appears in the "Acquired" field, which I do not use. Here are a few book IDs in case they are useful. The ability to export more fields is good. The ability to filter is good. There's only one problem that I've found. When I search by tags I can use a minus sign (or hyphen) to search for books that DON'T have a tag. Trying to do that in a filtered export seems to cause the export to hang up processing the first book. Solid. I haven't played with it yet, but it definitely look promising. Any chance of adding the ability to export directly from "Your books"? A single button that would take into account your current view (collection/tag/search) and prompt you for export format? Okay, I'm opening a bug for that, and pasting your comments in. We'll consider it. I could do it easily for most of what you do. But it's not clear I can easily do it for all searches, clicks, etc. >7 saltmanz:, >10 timspalding: Yes, please. 10: Cool. Not a real necessity (I probably wouldn't even use it much) but it just seems like the next logical step. I'm working on the encoding. The problem is, I think, that it's not being recognized as UTF8 by programs that open it. I'm going to tear my hair out. I'm worried we have to do that convert to UTF-16 with extra characters to get it to be read correctly by Excel. Argh. I had similar issues with character encoding but when I told Excel to open the file with UTF8 everything worked properly. Right. So the trick is convincing Excel that it's UTF8 to begin with. Anyone have an idea how to do this? Files don't have MIME types the way files do. Also noticed the Entry Date problem right away (also would prefer that the Entry Date column was in its old position with the other dates for easy comparison). I checked my previous export from a few weeks ago and all the books have entry dates. Off to check the other date columns now . . . and verifying that many of the Entry Dates are in the Acquired column instead (which is a column I DO use, so concerned about where those dates ended up). And the "Date Finished/Ended" column is "Date Read" instead, which is confusing/inaccurate. I seem to be missing some finish dates for books with no start date, but I'll have to go through one by one comparing with the previous export to locate the specific books because when I sort they aren't appearing, but could be buried somewhere in the 2400 lines. SO, while I appreciate all the options, I really just want the Export All file to be accurate . . . which right now it is not. I was glad to see the additional author column, though many of my books have more than two, so I'll still have to use my "more author info" tag and copy those by hand. I'm thinking I would rather the extra author info port off into a single column with all the info: author#2name, author#2role; author#3name, author#3role, etc. Must go take out the garbage, clean the litter box, and mop the kitchen floor . . . will explore this more later. Thanks for taking a step in the right direction. One more encoding thing . . . my Excel 2011 for Mac doesn't recognize .tsv as a readable file. I can change the open options to allow "all files" but then it wants to import it, which is where I can designate what type of file it is, etc. but adds several steps to the opening process. When I go to the property info of the file itself and designate it to Open With . . . Excel. It opens right away, but I'll need to check to see what happens with a few of the columns where I need it to import as text rather than General format (to preserve the 0s at the beginning of ISBNs that I've moved to the comments and private comments columns). We're going to have a big conversation with the team tomorrow about the best way to satisfice the file-type issue. So it may change again. Fundamentally, the file is UTF-8. Grumble. We may need to convert it all to that a miserable XLS format. Ick. Very nice. The tab-export converts easily to an ancient format called rdb. A side effect is that I got this list of the exported data. This might come handy when discussing anything amiss with the new export. So far I'm quite happy with it. >17 LucindaLibri: re: Other Authors. I get multiple Other Authors in that column, separated by pipes; and their roles in the next field, Other Author Roles. So it might require a bit of attention, but they're all in there and so are their roles. Order - I would truly love it if the fields were grouped more logically. All the dates together (instead of Entry Date being way off at the end). All the classifications together - as it is, LCCN is in one place, DDC a bit later, and LC Classification even further on. And all the work-level stuff together and at the end - work ID, subjects, etc. It's great to have it, but I won't be using it 99% of the time and keeping it together and out of the way would be wonderful. Pony - a cookie or something that lets us arrange the fields in our preferred order (I can see someone wanting Work ID right next to Book ID, for instance) and that's the way they export. Or possibly export based on views, or something like views? But then not all the fields would be covered (I'll never have Subject in my views...). And mild puzzlement - in what order do the records export? It's not book ID order, like the old TD, not entry order (which would be the same thing), not...??? Not a problem, since I resort them anyway as I investigate, but puzzling. I can open the file nicely in Calc, because it asks anyway. I can also set the types for the fields that want it (Text for title and Dewey (otherwise it loses leading 0s), Dates for the various date fields) which helps. Theoretically it's supposed to recognize dates, but it was missing some. As I said, I can set it to notice them as dates, in the appropriate order (dmy, mdy, ymd) - but to do so I have to page through each column (and with Review and Subjects, that's rather a pain) before I let Calc actually open the file. Very happy! Some tweaks, yeah sure, but this is lovely. No, fair enough. Nobody build anything based on the current order, okay? I'll get on some of your suggestions soon. In excel (earlier this evening) I was getting dates formated mm/dd/yy . . . the old export gave me the nn-mmm-yy . . . so not sure if the dates format you're getting is due to using Calc rather than Excel? I'll have to double check tomorrow about the multiple authors, but last I exported (several hours ago), the columns were labelled "Second Author" and "Second Author Role" so if multiple contributors are in those columns they need different names. @25: Yeah, multiple reading dates would be (very) nice, but I'm also not sure what form that would/should take. Pipe separation would be consistent with other authors, but also seems like it would feel odd in what is ostensibly a date field. "Light on Prāṇāyāma : the yogic art of breathing" turns into "Light on PrƒÅ·πáƒÅyƒÅma : the yogic art of breathing"
Is THAT last one the one I should be choosing? >27 LucindaLibri: Ah, it's actually Secondary Author (& ...Role). So it's singular, but putting in parentheses is probably not a good idea... technically it should be Secondary Author(s), but probably not worth it. >29 LucindaLibri: Um...probably? In Calc it's "Unicode (UTF-8)", looks about the same. Does it come out clean (without weird characters) if you choose that one? >28 saltmanz: Huh. Tried it again on a different machine - the exact same file, I think the same version of Calc (though that may not be true), and nothing set on the date fields (I didn't choose any options) - and I got dd/mm/yy for all four date fields. So possibly not anything that needs changing. Oh, no, on more careful examination - while it shows up as dd/mm/yy, it's a text field not a date (sorts wrong). But if I choose "detect special numbers" they are dates. So that's a matter of how smart Calc is being - it exports (checking in a text program) as the unquoted text dd/mm/yy, and it depends on the program reading it correctly and displaying it reasonably. And I have no idea why it would display them differently in different fields - same format (to my eye, at least). I think the difference between your dd/mm/yy and my yyyy-mm-dd is a setting on our profiles? Maybe you have the default date format and I have chosen the ISO standard? The date formatting on your profile won't change this. Perhaps it should, but I think we're better off with standardization. What's the best date format for us to provide? Whatever that is, we'll do it. YYYY-MM-DD? >32 timspalding: My vote is for YYYY-MM-DD. But anything I can parse is okay with me. >32 timspalding: I would like to second the vote for YYYY-MM-DD, please. I've been following along on most of the export threads even though I don't export data (although I probably should, as a backup, if for no other reason), but that format is the most useful. Of course, to be proper, that would have had a lot more capitalization. Yes, when I went back and exported again I see the pipes in the Secondary Authors & Roles columns. I then added a space before and after each pipe to make it more readable (quick find & replace). Will try another export later today and open as Unicode 6.1 UTF-8 to see what happens. Thanks!! >36 timspalding: Export as Excel -- wonderful. This works great if I click on the link and tell Windows I want to download the file, and then I open it in Excel. The downloaded file has an "xls" extension. I get an error about the file being in a different format than the extension, but click OK and it loads into Excel just fine. If I click on the download link and tell Windows to open it in Excel instead of downloading, I get a different error message: "Excel cannot open the file .xlsx because the file format or file extension is not valid. Verify that the file has not been corrupted and that the file extension matches the format of the file"
Note that in the second case the extension is "xlsx". I'm using Win7 and Excel 2010. Still a bad tab text and bad buttons on localised sites. Voting for date format YYYY-MM-DD, more readable than unix timestamp. Just saying that trying to create such files is hard. I would stick in CSV or TSV, since Excel can import those (at least with some human help). 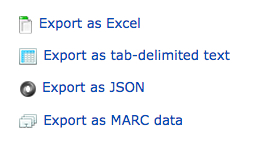 The Excel export still appears to be tab-delimited text (completely what I'd expect and recommend). Excel can deal with this most of the time. Occasionally the OS gets in the way. It is sometimes necessary to add this to a file like mime.types to help associate the extension with the type in addition to your dynamic code in PHP. Bug: after selecting "export as TSV" I get on page, where I seem to be able to change export format with radio buttons. Selection does not seem to have any effect i.e. even after changing to JSON I still download TSV file. The webpage url seems to contain file format selection, did not change. I would like an option to omit the green. will fix your broken json output file and hopefully Tim et all will fix the buggy json exporter soonish, so we don't need to fix it . PS If you post the bugs in the group Bug Collectors the chances of getting them fixed are much better than if you just post them as posting #42 in a long thread. Finally got back to checking some more things in the new export. Used Export as Excel, which still walks me through the import steps when I try to open it, but turns out I need/want to do that anyway so I can specify column formats, etc. Choosing Unicode 6.1 UTF-8 as the "File Origin" in Excel got rid of the odd characters, even in the Sanskrit words/titles! Yeah. Still need to check my special list of 30+ books that had dates problems to make sure they are now all fixed, but everything else is looking good. I also played around with it this weekend, and boy, did I think I had a clean catalogue? That doesn't make sense. If you're getting a green English in Your Library then it should either export as English (Tim's already done that for some other fields that can have green entries) or nothing. Exporting German in that case is bizarre. I think you should report it as a bug. Tim said green text would export now - so yeah, if you're seeing English the export should show English. Thanks :) I've already fixed all of that field, but at least that will save me fixing the other fields where I see green entries (if they're ok). Thank you Tim et all. I was trying to export my library and parts of it (filtered library) as excel, as tab-separeted and as json files. Am I alone with that problem? I have tried to export tab-delimited files, and the "working" icon comes on but stays stuck at either 100 records processed (a few days ago) or 1 record processed (today). The Excel option doesn't even start up the working icon. Windows 8 with Internet Explorer as browser. >50 birder4106: You say you are doing a filtered export. >52 librisissimo: Are you filtering or exporting all? I was the original reporter of this "bug", but I don't think it's actually a bug, I think it's really about using "tags" and "search" for different things. I also tried to export as excel, as json and as tab-delimited text. I tried once to export my smallest collection (only 3 books) in case there was a size-of-file problem, but it didn't work either. Today (exporting all records as Excel file) I didn't even get the turning wheel icon, just the message "attempting export" and then nothing (waited about ten minutes to see if the processing completed but no dice; in the past exporting has taken less than a minute). I do have an inordinate number of tags in every record, if that is a consideration for some reason. JFTR, since I was the last poster, my export is working now. Another FYI: I discovered the hard way that the new export switched the order of the Collections and Tags columns. I was combining records from different 2014 exports. I knew I would have to deal with new columns and that the date columns were in a different place, etc. but after I thought I had everything lined up just right and sorted it altogether :( I found the mixup with the Collections and Tags columns. I fixed everything using copy and paste and an empty column, but just thought it was worth a warning for anyone who is combining data from the various exports. Now off to make myself a cheat sheet of reminders about the old and new columns, character formats, etc. and what I need to remember to do when exporting. JFTR, a complete export of my file on 2015-04-012 does not have this problem. I did a small test filtering for a single tag, the export included books without that tag...but they did have that tag many months ago. I filtered for the tag "want" and the book People of the Book was included in the export without the tag. I probably removed that tag last summer or early fall from that book. There are other examples in my export if needed. If it is working off of old info then it seems like the tag should also show up - but it doesn't.